Walls can be used in the landscape for a number of reasons. You may need a retaining wall for a large scale commercial project or just a small residential setting. The thing to remember is your limits are endless finishes, colors, man made stone, or natural . We can offer you quality product, talented installers and creative solutions. Walls in a landscape are often unnoticed. They quietly provide a stylish addition to an outdoor scene without grabbing so much attention. But when the walls are out of the scene, just one look and you know that something is missing. Elements as powerful as these should never be missed. That’s why at Rainbow Acres Landscaping, we believe that properly designed and built walls are a must in any landscape. Walls, sometimes referred to as retaining walls, are actually made to suppress earth that would otherwise slide downwards. So in their most basic sense, retaining walls are not really style elements but necessary addition for a safe environment. But these walls simply got a lot of potentials that using them for other purposes is very hard to ignore. That’s why designing a retaining wall will not only require wise computation on its thickness and angle. Its surface style must be thought out carefully, too, so that it will not just be a wall that retains earth but a wall with artistic impressions. Besides holding back earth, retaining walls are also added to a landscape for a higher, bigger plant box or a division of two driveways. They can be as short as a meter to as long as a kilometer or more. No matter how big the needed wall is, we can install that for a residential or commercial area. 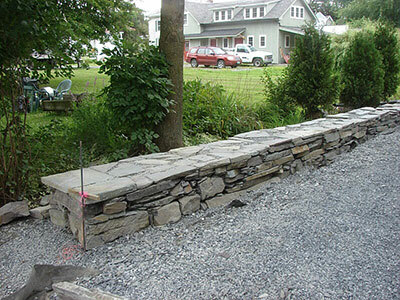 At Rainbow Acres Landscaping, we use only the most durable materials for retaining walls. Many Vermont homes and commercial spaces use wood. This may work for quite a while, but it will never last long. Soon it will require replacement. While that’s not yet happening, it is a potential danger for everyone. Another common choice is the poured concrete. But just like any other concrete, cracking is inevitable with this wall. Eventually, the concrete wall will crack and will require immediate replacement. This is the reason why we highly recommend using of only strong yet stylish materials for the walls like natural stones, bricks, and stone veneers. All these materials will result to the so-called block walls, which are made by interlocking single pieces of materials. All these last longer and look more stunning than the cheaper choices. No worries even if you want to save. We will help you adjust the price of wall construction so it will fit to your budget without compromising quality and style. Please check our portfolio for samples of our past wall projects. Your wall can be more beautiful than those. Conventional block walls are the safest choice because they have been the choice in many parts of Vermont. They’re solid, stable, and stylish. Another choice is the mortarless and dry-stacked wall. It provides more colors and textures but the blocks used are larger, costlier, and heavier than the conventional type. But mortarless is a good choice for shorter and smaller walls because they are easier to move or disassemble when necessary. Any style of retaining wall can still be more stylish by adding beautiful plants, flowers, or even a living space on top of the wall. There are a lot of possibilities, really. So let’s just talk this over the phone. Don’t hesitate to call us or use our free estimate service. We will be happy to be of service to you, especially if it’s all about beautifying residential or commercial walls in Vermont.